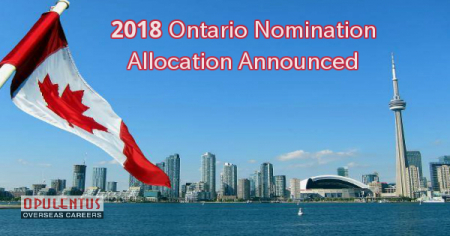 The Ontario Immigrant Nominee Program has announced an increase in the allocation for the province for the year 2018 by 600. With this, the nominations now stand at 6,600. Please access the Ontario Immigrant Nominee Program e-Filing Portal directly from the website of OINP. There is a link to the e-Filing Portal on each stream webpage. The Program monitors the intake of applications regarding the limits set for Ontario’s federal nomination allocation for the year. Aspirants will receive the information when the OINP stops accepting the applications through the Update webpage. The Application Guides have been recently updated owing to the Proclamation of Immigration Act, Ontario 2015 on January 1, 2018. They need to be referred carefully, before submitting an application, in view of the changes in criteria and processes. Additionally, the Program will start to issue Notifications of Interest to applicants again when they qualify for Human Capital Priorities Stream of the Ontario Express Entry. Please check the page meant for Program Updates to know the news regarding the OINP accepting the applications for the Masters Graduate Stream and Ph.D. Graduate Stream.